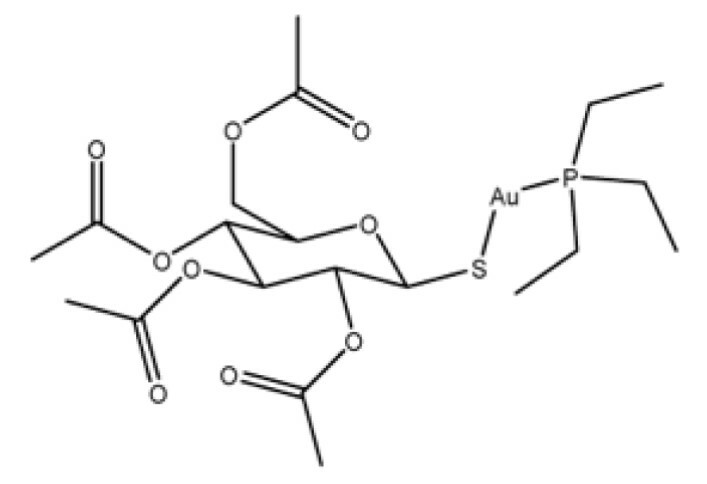 Auranofin is a gold complex classified by the World Health Organization as an antirheumatic agent. It has the brand name Ridaura. Auranofin is used to treat rheumatoid arthritis. It improves arthritis symptoms including painful or tender and swollen joints and morning stiffness. Auranofin is under investigation as a means of reducing the viral reservoir of HIV that lies latent in the body's T-cells despite treatment with antiretroviral therapy. Auranofin has been identified in a high-throughput drug screen as 10 times more potent than metronidazole against Entamoeba histolytica, the protozoan agent of human amebiasis. Assays of thioredoxin reductase and transcriptional profiling suggest that the effect of auranofin on the enzyme enhances the sensitivity of the trophozoites to reactive oxygen-mediated killing in mouse and hamster models; the results are marked reductions of the number of parasites, the inflammatory reaction to the infestation, and the damage to the liver. In a cell-based screen, auranofin showed potent activity against replicating and non-replicating M. tuberculosis as well as other gram-positive bacteria. Auranofin protected mice from an otherwise lethal infection with methicillin-resistant S. aureus (MRSA). The drug acts in a similar manner in bacteria as in parasites by inhibiting thioredoxin reductase (TrxR). Studies in humans are needed to evaluate the potential of this drug to treat Gram-positive bacterial infections in humans. Phase I Clinical Trial Results of Auranofin, a Novel Antiparasitic Agent. Capparelli EV, Bricker-Ford R, Rogers MJ, McKerrow JH, Reed SL. Antimicrob Agents Chemother. 2016 Dec 27;61(1). Lin et al. 2016.Mycobacterium tuberculosis Thioredoxin Reductase Is Essential for Thiol Redox Homeostasis but Plays a Minor Role in Antioxidant Defense. PLoS Pathog. 2016 Jun 1;12(6):e1005675.